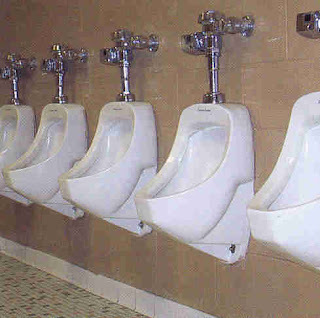 Many of the products now in use in washroom urinal drip systems are simply strong odor 'cover up' products that frankly, don't work very well. Typically they combine the addition of a (hopefully, but not always) pleasant scent to the urinal with a low daily cost. This can give a false feeling of security to the business operator, as they can 'smell' the system working, however, the ongoing cost of using a 'cover up' product to control odors doesn't actually do anything to remove the source of the problem - urine. Typical chemical cleaning products used in the washroom don't actually remove urine from between tiles so the smell continues to persist. As a result, the combination of typical cleaners and urinal drip products can actually cost you more in the long run as you usually add more urinal product than necessary to control odor plus you will have multiple cleanings during the day and added cleaning costs in the washroom. EATOILS™ SUPERFRESH™ is a superior GREENER-CHOICE™ APPROVED GREEN CLEANING PRODUCT using natural surfactants to deep clean all surfaces and following up with beneficial microbes that digest residual organic materials from deep down in the pores of all surfaces including tile and grout, effectively removing contaminants with a continuous, ongoing cleaning action. EATOILS™ SUPERFRESH™ not only can be used to effectively clean your washrooms as part of your daily cleaning program (using 2 ounces per gallon of warm water in your wash bucket, spray bottle, 'wet swiffer type' mop, or alternative cleaning system), but it can also be diluted(4 - 6 oz/gallon of water) and used in your urinal drip system as well, providing a 'self cleaning', more odor friendly environment for your customers. In addition, the cost of using EATOILS™ SUPERFRESH™ in your urinal system this way can actually be substantially less than what you are currently paying. A recent study in a public school with two identical Girls washrooms with equal traffic and wear and tear, found that the washroom cleaned with EATOILS™ SUPERFRESH™ was at least twice as effective as the one cleaned with traditional cleaning products - the client needed to clean the washroom with traditional cleaning products two to three times as often as the one cleaned with EATOILS™ SUPERFRESH™, consistently, over the two week study. The EATOILS™ SUPERFRESH™ washroom stayed cleaner longer and the actual cleaning job was easier with the EATOILS™ SUPERFRESH™.